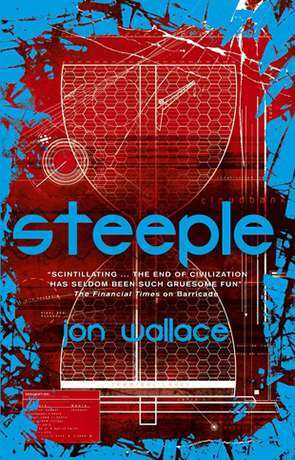 Steeple is the sequel to the quite brilliant novel Barricade which we reviewed back in June last year. It describes a post-apocalyptic world torn apart by a war of human against their artificial, super-human constructs, the "fiscials". As you can imagine, fighting against a superior force of artificial people that don't have the weakness of pain, hunger or compassion proves fairly disasterous for homo-sapien. The resulting wasteland see's the Fiscials controlling the big cities, barricaded against the "savage" humans — who eke out an existence amongst the scorched wasteland and rubble. Kentisbec is a Fiscial — or at least he was until a disaster robbed him of the nanotechnology that constantly repaired him. Now he's as vulnerable as the few weak and soft humans who remain in this blighted world. The secret that may save his sorry hide lies at the top of the "Steeple", a one thousand story tower looming over the remnants of London. Haunted by attack drones and cannibals, the only way to uncover the secret is up the tremulous tower. After reading Barricade I fervently hoped the author would continue the story, the authors vision of a bleak future britain may not be unique but it's one of the best examples there is. The series is set apart by the use of a blistering pace, graphic and well choerographed fights and above all a wonderfully dry gallows humour which prevents things getting too serious. The use of the Fiscial, an anti-hero, as the central protagonist provides an effective insight into the human condition and also makes a pleasant change. It is uncompromising and graphic at times so if you don't like blood, guts and the occasional cus word, you might as well move along. Kentisbec is one of those characters that you probably shouldn't like, he's ruthless, self-centrered and unhindered by emotion. Yet that's just how he was created — he's not actually "bad" unless we judge him by our own flawed standards. We get to uncover a great deal more of this interesting character, while he learns more of the frailties and issues that mortality presents. The author provides more colour to this post-apocalyptic canvas too — and it's a broader scope, clearer that this is part of a series rather than a stand-alone adventure. The story moves along as if it's being propelled by a jet ski and matches Barricade for inventiveness and humour. Steeple is a pretty much perfect follow-up, it does everything a sequel should — broadens the story, the world and its people without re-treading old ground while keeping the voice and more importantly moving things forward. Read Barricade and then read this, you will not be dissapointed. Written on 31st August 2015 by Ant.